Discover the creative CG process behind Marvel's latest hit. When Thor’s father dies, his murderous elder sister Hela, Goddess of Death, is released from the ancient prison that has prevented her from wreaking havoc until now. She wastes no time with her new freedom and seeks to take her place as ruler of Asgard by bringing about Ragnarok; a process which necessitates thousands of hours of CG work and 3D art to successfully enact. One of the biggest 3D movies of last year, this is your typical big-action blockbuster from Marvel, except in many ways it’s not. Director Taika Waititi, known for comedies such as Hunt for the Wilderpeople and What We Do in the Shadows, has brought his special brand of humour and put his own unique spin on things. So while there’s plenty of the elaborate set pieces and high-octane frisson we’re used to, there’s an element of personality to this film that’s new. Unsurprisingly for a Marvel superhero adventure, visual effects were a core part of the production: whole worlds are constructed entirely as CG, as are several characters, and Cate Blanchett’s entire Hela costume is computer generated. Even director Taika Waititi was spotted wearing a motion capture suit during shooting. As a visual effects vendor from the start of production, the team at Framestore were on board to deliver challenging sequences at very short notice. In the climactic battle of the film, the Hulk fights Hela’s giant wolf Fenris, both on a narrow bridge and also down in the waters beneath, before returning at the end of the sequence to jump on the fire demon Surtur and rescue Thor and Valkyrie. A team at Framestore led by VFX supervisor Alexis Wajsbrot was tasked with bringing this action to life. They received previz of the whole action by The Third Floor, which was constantly being updated throughout the editing process, and started with shots of Fenris and Hulk both roaring and fighting on the bridge. “It was the first time that Framestore got to work on the Hulk, so the whole team was incredibly motivated to get the best possible version of him; we did a lot of work on the asset, in terms of the muscles rig and shader,” explains Wajsbrot. Some of Framestore’s best animators worked on the posing of both Hulk and Fenris to get the strongest position and angle, and they produced a range of options which were proposed to Marvel visual effects supervisor Jake Morrison and director Taika Waititi. The team even proposed some new shots; “One close-up of Hulk fighting Fenris in the water did make the final cut!” says Wajsbrot. A camera positioned very close to rapidly moving water and two huge creatures splashing around meant that the interaction between the water and the characters was one of the most challenging aspects. 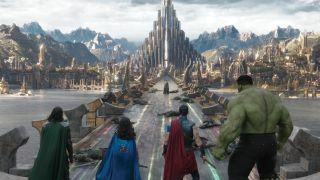 As is typically the case on big blockbuster productions, visual effects teams on Thor: Ragnarok were required to produce complex work on tight timescales. During the final month of production the team managed to deliver two very challenging close-up waterfall shots depicting the Hulk falling and grabbing onto a cliff – “[It] was really an achievement in terms of efficiency,” Wajsbrot says. Alexis Wajsbrot’s crew wasn’t alone in this: Framestore’s capture lab was also put through its paces when they were called upon to deliver some crowd scenes on a particularly short deadline. The battle in the third act of the film takes place on the narrow Rainbow Bridge when Hela’s undead army attacks Thor’s homeworld of Asgard, and Framestore were assigned the task of populating the scene with crowds of both zombie soldiers and terrified citizens. It’s a difficult scene because dozens of characters need to be on screen at once, and they all need to be reactive to the battle going on around them. In addition, the undead soldiers move like warriors, but have the animated attributes of corpses. so instead Framestore used just two actors and their in-house capture lab to generate the members of the crowds. The capture lab is kitted out with 16 Vicon T40 cameras, and capture software Shogun Live and Post, also produced by Vicon. It is set up in one of the London offices semi permanently and gets taken out to a bigger stage occasionally for shoots that need more space. To create soldiers and citizens who would react in their own individual ways to the events unfolding around them, two motion capture actors performed a multitude of actions such as running away, jumping off things, getting shot and dying. “One of [the actors] is actually an animator at Framestore – so he really understands the whole process and performance requirement,” capture lab studio manager Richard Graham says. Some of the characters in Thor are much larger than others, which presents some challenges for mocap teams and animators. Graham explained it’s handled “by spending more effort on the re-targeting and working with the performer to make sure their motions impart the right sense of scale”. With the motion laid down as well as possible, muscle and skin sims are used to sell the final animation. This article was originally published in issue 231 of 3D World, the world's best-selling magazine for CG artists. Buy issue 231 or subscribe to 3D World.